AIDA is a global leader in the design, manufacture, sale, service and support, refurbishment and modernization of metal stamping presses and metalforming automation equipment. With a worldwide network of sales and service locations in 36 cities across 18 countries, and press installations in over 60 countries worldwide, AIDA is truly a global metalforming solutions provider. Presses Demonstrate AIDA's Industry Leading Stamping Press Technology at FABTECH® Mexico 2019, AIDA-America Booth 408 AIDA-America, Dayton, OH, USA, will demonstrate industry leading press technology in booth 408 at FABTECH® Mexico 2019. Two AIDA Presses will be demonstrated at this year's FABTECH® Mexico event, taking place from May 7th through 9th at Cintermex International Convention and Exhibition Center, Monterrey, MX. The first, an AIDA NC1-800(2)E, 80-ton, mechanical gap frame press is part of AIDA's high quality, industry leading gap frame press line, with models ranging from 35 to 250 tons. The fastest acting hydraulic overload protection (HOLP) in the industry at 10 ms, a highly rigid frame with low angular deflection, and the tightest clearances available in a gap frame press, which minimize reverse tonnage, are just a few standard features of these presses. 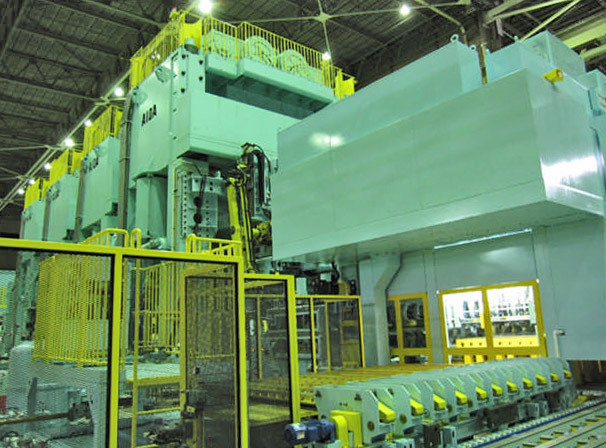 The second is an 80-ton AIDA gap frame servo press, model DSF-C1-800, and part of AIDA's gap frame servo press line, with models ranging from 80 to 250 tons. Utilizing the same mechanical drive train of the tried and true NC1 mechanical gap frame, these DSF-C1 series direct drive servo presses combine the versatility of an open die space area with the flexibility of the freely programmable servo motion. The DSF-C1-800 press will be blanking parts, demonstrating AIDA's Silent Blanking motion profile, which can only be achieved on a servo press. This demonstration will also highlight the versatility of AIDA servo presses. Additionally, AIDA will be exhibiting its exclusive Allen-Bradley based servo press control, the latest in servo press control technology, for servo presses from 315 - 3,500 tons. This fully operational and interactive Allen-Bradley control will demonstrate several servo press stroke motion profiles in real-time on a virtual press. Knowledgeable AIDA associates will be available to demonstrate both presses and the Allen-Bradley servo press control, share their features and benefits, and explain the advantages AIDA's top quality presses can bring to any pressroom. AIDA 630 Ton Servo Press Installed at Omex Manufacturing ULC Increases Production and Provides Additional Benefits AIDA-America, metal stamping press manufacturer in Dayton, OH, USA, congratulates Omex Manufacturing ULC on the installation of their first servo press, a 630 Ton model DSF-M2 transfer press. By moving the stamping of an automotive spindle from a mechanical press to their new AIDA DSF Series direct drive servo press, Omex improved their part quality, increased their production speed by over 20 percent, reduced their scrap rate by 1.5 percent, and increased their tool life by 15 percent. To achieve these improvements, Omex partnered with AIDA-America through servo application training and created the optimized motion profile now utilized to form this automotive spindle. AIDA-America Recently Hosted Manufacturing Day® Event AIDA-America, metal stamping press manufacturer, recently hosted a Manufacturing Day® event at its Dayton, OH, USA facility on October 5th. Around 60 total students had the opportunity to learn about AIDA-America's capabilities and tour its industry leading 180,000 sq. ft. manufacturing facility, as AIDA did its part to inspire the next generation of manufacturers. One group of students from the Miami Valley Career Technology Center and one group from Centerville High School visited AIDA-America during this nationwide event that celebrates modern manufacturing. Servo Presses Demonstrate Near-Fine Blanking, HSLA Blanking, Increased Productivity, and Improved Part Quality at FABTECH® Atlanta 2018, AIDA-America Booth A2009 AIDA-America, metal stamping press manufacturer, Dayton, OH, USA, will demonstrate industry leading servo press technology in booth A2009 at FABTECH® Atlanta 2018. Two AIDA DSF Series direct drive servo presses will be on display, powered-up and blanking parts at this year's FABTECH® show taking place from November 6 through 8 at the Georgia World Congress Center, Atlanta, GA. The first, an AIDA DSF-C1-1100, 110-ton, gap frame servo press, will be blanking HSLA parts with AIDA's optimized servo silent blanking stroke motion profile, which can only be achieved on a servo press. This demonstration will also highlight the versatility of AIDA servo presses and show how they can improve virtually any stamping operation. These improvements include increased productivity, improved part quality, extended die life, and reduced maintenance, as well as addressing many more important issues for those in the stamping industry. The second AIDA DSF Series press on display, a DSF-N2-3000, 300-ton, two-point straightside servo press, will be part of a full progressive die production line blanking near-fine parts. AIDA's industry leading servo technology will demonstrate how servo near-fine blanking can produce a 90%+ burnished surface with a straight edge, exceeding the typical 70%-80% burnished edge requirement of many applications. The combination of AIDA DSF Series servo press accuracy and programmability is utilized to transition near-fine parts from a high-cost, labor intensive machine process to a much more efficient, economical stamping process, presenting the opportunity to dramatically reduce the per piece cost. AIDA DSF Series servo presses also provide more flexibility to the pressroom than traditional fine blanking presses. This production line is made possible through the cooperation of Portland Products, Inc., Portland, MI, who will be taking delivery of the press after FABTECH®. AIDA-America will also be coordinating with Dallas Industries and Pax Products for this demonstration. AIDA-America associates will be available to discuss examples of production optimization driven by AIDA DSF Series servo presses used in the stamping industry. They will share how these infinitely programmable presses can help maximize stampers' productivity and profit in the press room. AIDA-America Hires Ryan Mason as Project Manager AIDA-America, metal stamping press manufacturer in Dayton, OH, USA, recently hired Ryan Mason as Project Manager to join AIDA-America's degreed engineer Project Management Team. A dedicated Project Manager coordinates with internal departments and external vendors, serving as a single point of customer contact throughout the life of each project. AIDA-America Recently Hosted 2018 Servo Symposium AIDA-America, metal stamping press manufacturer, recently held the 2018 Servo Symposium at its Dayton, OH, USA facility. The by-invitation-only event, held on June 13th and 14th, provided attendees with the opportunity to attend educational seminars, tour AIDA-America's industry leading press manufacturing facility, and view live technology demonstrations. Symposium attendance was near maximum capacity, with AIDA-America hosting a total of 125 guests from across North America, representing 52 companies. AIDA-America Hires Oscar Zamorano as México Regional Sales Manager AIDA-America, metal stamping press manufacturer in Dayton, OH, USA, recently hired Oscar Zamorano as México Regional Sales Manager for central and southern México. Oscar, with his engineering background and technical sales experience, will support customers in the established and growing metal stamping market in México. Ryo Arai Recently Joined AIDA-America as Project Engineer, After Market Solutions (AMS) Ryo Arai recently transferred to AIDA-America, metal stamping press manufacturer in Dayton, OH, USA, as Project Engineer, After Market Solutions (AMS). He brings over three years of experience, including press modernization, from AIDA Engineering in Japan and will coordinate with customers on assigned projects from purchase through completion sign off. He is also one of the AMS team members responsible for technical design of department projects. AIDA de México Facility Continues to Grow AIDA de México, subsidiary of AIDA-America, metal stamping press manufacturer in Dayton, OH, USA, continues to grow. The Querétaro service facility has expanded and has also increased its staff by more than 25% over the past year to support customers in México. AIDA Engineering de México now employees 13 team members to support the established and growing metal stamping market in México, including technical staff to install presses and supply parts. AIDA-America Hires Mason Round as Project Manager AIDA-America, metal stamping press manufacturer in Dayton, OH, USA, recently hired Mason Round as Project Manager to join AIDA-America's degreed engineer Project Management Team. A dedicated Project Manager serves as a single point of contact for all customer needs throughout the life of each project. Servo Presses Demonstrate In-Die Tapping, HSLA Blanking, Productivity Improvements at Fabtech Las Vegas 2016, AIDA-America Booth C17024 AIDA-America, metal stamping press manufacturer in Dayton, OH, USA, will demonstrate industry leading servo press technology in booth C17024 at Fabtech Las Vegas 2016. Two AIDA DSF Series Servo Presses will be on display, powered-up and stamping parts at this year's Fabtech event taking place November 16 through 18 at the Las Vegas Convention Center. The first, an AIDA DSF-C1-1500, 150-ton, gap frame servo press, will be blanking HSLA material and demonstrating AIDA's Silent Blanking motion profile which can only be achieved using a servo press. The demonstration will also highlight the versatility of AIDA servo presses and how they can improve virtually any stamping operation. These improvements include increased productivity, improved part quality, increased die life, reduced maintenance, and many more important issues for those in the stamping industry. The second AIDA DSF Series press on display, a DSF-N2-3000, 300-ton, two-point unitized frame servo press, will be part of a full production line. AIDA-America has partnered with Dallas Industries (complete feedline), Pax Products (part/scrap removal & lubrication system), Heidtman Steel (hot rolled mild steel) and Automated Tapping Systems (servo-driven in-die tapping) to showcase this complete production line featuring a progressive die with a horizontal in-die tapping system. AIDA-America associates will be available to share examples of production optimization driven by AIDA DSF Servo presses used in the stamping industry and discuss how these infinitely programmable presses can help maximize stampers' productivity and profit in the press room. AIDA-America, Qualtek Manufacturing Inc. Announce Leadership Changes 11-1-16, AIDA-America, metal stamping press manufacturer in Dayton, OH, USA, and Qualtek Manufacturing Inc., Colorado Springs, CO, USA are jointly announcing leadership changes within their respective organizations. Troy Roberts, current President/COO of AIDA-America will be transitioning to the position of CEO at Qualtek Manufacturing, effective December 1st, 2016. Mr. Roberts' decision to leave AIDA-America was prompted by the opportunity at Qualtek and his strong desire to be closer to family and the great outdoors. While Troy will be missed, he is leaving AIDA-America as the North American market leader of metalforming suppliers and in the very capable hands of the 200 associates that he has worked with over the past 21 years. In his new role at Qualtek, Troy will lead Qualtek's team in achieving its goal to become the premier stamping, heat treating and metal finishing supplier to aerospace, medical device and automotive manufacturers. Pat Ambuske, AIDA-America's current Vice President of Operations, will succeed Mr. Roberts as President & CEO, effective December 1st, 2016. Mr. Ambuske joined AIDA-America in 2001 and has held various leadership roles over planning, engineering, purchasing and manufacturing functions during his 15 year tenure at the company. Pat has played a key role in much of AIDA-America's recent success. With Pat's guidance, the local engineering team has experienced significant growth. He has helped sharpen their focus on solutions designed for North American stampers, specifically applying AIDA servo technology to a wide range of products. Significant plant and manufacturing operations expansions have taken place under Pat's leadership, positioning AIDA-America as the largest and most advanced manufacturer of stampingpresses in North America. Pat will continue to build on AIDA's success as the leader in servo press technology. As a team, AIDA-America will continue to push forward the policies of constant product improvement and deep partnership with customers to create the most effective production systems. AIDA-America will also maintain the standard of excellence in customer service and on-going support. Both Troy Roberts and Pat Ambuske will be attending the Fabtech 2016 Las Vegas tradeshow, taking place November 16th through 18th at the Las Vegas Convention Center, and will be greeting visitors, customers, industry professionals and all others in AIDA-America's booth, C17024. They encourage all interested parties to visit the booth to personally discuss this exciting new chapter for both Qualtek and AIDA-America. AIDA Europe Opens New European Technology Center in Weingarten, Germany AIDA ENGINEERING Ltd., world leader in SERVO technology for metal forming equipment, will open their new European Technology Center in Weingarten/Germany on 1st of August 2016. AIDA EUROPE GmbH will have Sales & Engineering functions as well as Project Management, Purchasing and other activities. Combined with the already existing service operations, AIDA will be serving its northern, central and eastern European customers more closely and effectively and will strengthen its position as a leading supplier of Press Forming Systems. Current functions and manufacturing for Europe will remain in Italy and together with AIDA's other manufacturing facilities in Japan, China, Malaysia and the USA, it will produce Tandem Lines, Transfer Presses and Blanking Lines of all sizes and configurations. Mr. Aida stated, "The Bodensee-Oberschwaben region is one of the most innovative regions in Germany and many of our customers and suppliers are located here. Therefore, we decided to open our office here in Weingarten." Klaus Rothenhagen, Vice President Sales of AIDA EUROPE, added "By opening our new office in Weingarten, AIDA can better serve our German and European customers more efficiently. By strengthening and expanding the service department, AIDA can ensure professional support for our customers." 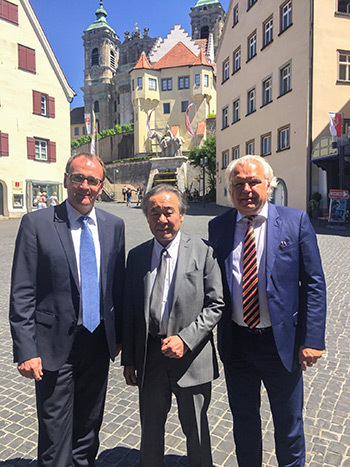 Markus Ewald, the mayor of Weingarten, welcomed Mr. Aida last week and congratulated him for AIDA's decision to locate the new European Tech Center in Weingarten. Initially, AIDA will increase the number of employees in Germany up to 50. In Europe, AIDA has more than 400 associates and around 1,800 globally. The management team will consist of Hans Kurt (Administration), Klaus Rothenhagen (Sales) and Thomas Spiesshofer (Technology and Engineering). Thomas Spiesshofer will join AIDA EUROPE GmbH in 2017. Among the various forming systems for processing metal, press metalforming remains the technological leader in providing high-quality and high-volume production of metal parts with outstanding efficiency. Since its founding in 1917, AIDA ENGINEERING Ltd., as a forming system builder, has promoted technical innovation in industrial products by continuously rising to the challenge of developing new technologies. As AIDA approaches the 100th anniversary of its founding, market globalization and growing environmental and energy concerns are giving rise to new demands on industrial manufacturing. AIDA is creating the high value-added forming systems that respond to these demands as it aims to strengthen its presence in the global market and establish itself as a top global brand in forming technology. AIDA-America Launches New YouTube Channel AIDA-America's New YouTube Channel has added 9 Videos. View them now and subscribe to the channel to keep up-to-date as new videos are added. The channel includes footage from AIDA-America's advanced press manufacturing facility in Dayton, OH, USA, large servo presses (1,500, 2,000 & 3,000 ton models), presses in production at our equipment users' facilities and more. ISMR Visits AIDA EuropeInternational Sheet Metal Review recently visited AIDA Europe's Open House in Italy and met its President, Peter Maddix. Please read the interesting article about AIDA Europe here below. AIDA DSF-C1-1500 Servo Press at Fabtech Canada 2016AIDA-America, metal stamping press manufacturer in Dayton, OH, USA, in partnership with Veugen Integrated Technologies, will display a DSF-C1-1500, 150 Ton Gap Frame Servo Press at Fabtech Canada 2015. The display will include an HSLA blanking operation and will show the benefits that can be gained from the infinitely programmable control of the AIDA DSF Servo Press. The show will take place at the Toronto Congress Centre from March 22nd - 24th, 2016. AIDA at Metalworking International Exhibition 2015AIDA will be at the Metalworking International Exhibition April 7th-10th, 2015 in Minsk, Belarus. Please visit stand F8 to learn how AIDA, the leader in servo press technology, can greatly improve the productivity of your stamping operations. AIDA has been the first company in the world to develop and market direct-drive servo presses, delivering to date over one thousand units worldwide. AIDA Direct Drive Servo Former (DSF) presses are the revolutionary forming systems for the 21st Century. DSF presses are attracting more and more customers who aim at boosting their productivity andincreasing their competitive advantages in the global metalforming industry, while achieving sustainable business development. AIDA at EuroBlech 2014 At EuroBLECH 2014, AIDA is proud to exhibit one of its state-of-the-art DSF-M2 servo presses, which is part of the complete high performance product portfolio of the company. "AIDA – Umformtechnik für die Zukunft- Technologie, Trends und Fakten"
Wir laden Sie herzlich zur Pressekonferenz anlässlich der EUROBLECH 2014 in Hannover ein. Sprecher werden Herr KIMIKAZU AIDA (CEO AIDA ENGINEERING), Peter Maddix (President AIDA EUROPE) und Herr KLAUS ROTHENHAGEN (VP SALES AIDA EUROPE) sein. Bitte melden Sie sich per Email unter krothenhagen@aida-europe.com an. Wir freuen uns, sie auf unserer Pressekonferenz begrüßen zu dürfen. "AIDA – Metalforming for the Future, Technology, Trends and Facts"
We like to invite you to our press conference during the EUROBLECH SHOW 2014 in Hanover. AIDA-America at Fabtech 2014AIDA-America, booth #B1601, will have (2) Direct Drive Servo Formers (DSF Series) on display at Fabtech 2014, both a part of AIDA's complete line of servo presses ranging from 80 to 3,000 tons. Each DSF Series Servo Press displayed will feature live demonstrations and parts production. An AIDA DSF-N2-3000, 300 ton, straightside servo press, recently purchased by, and courtesy of National Frame Rail, will be producing parts from 4.5mm thick, 120mm wide material in a progressive die operation. Also displayed, an HSLA blanking operation will highlight the drastic reduction in reverse tonnage via Silent Blanking from an AIDA DSF-C1-1500, 150 ton press. Please visit #B1601 and learn how AIDA, the leader in servo press technology, can greatly improve the productivity of your stamping operations. AIDA-America at Fabtech 2013 AIDA-America, Dayton, OH, USA, booth #S4625, will have (3) Direct Drive Servo Formers (DSF Series) on display at this year's Fabtech Exhibition in Chicago, IL. Each of the AIDA DSF Series Servo Presses will feature a different demonstration including tooling and parts production. One of the demonstrations will feature an AIDA DSF-N2-3000, 300 ton, straightside servo press, recently purchased by, and courtesy of Jagemann Stamping, Manitowoc, WI . In cooperation with Formtek/CWP and Pax Products, with material provided by Heidtman Steel Products, the DSF-N2-3000 Servo Press will be producing a pipe flange part from 4.5mm thick, 120mm wide material via a progressive die operation. Additionally, AIDA, in cooperation with Hyson Products and making use of their servo die cushion, will display the advantages of using a DSF Series Servo press for a difficult drawing application. AIDA-America will also display an HSLA blanking operation highlighting the ability of a DSF Series Servo press to dramatically reduce reverse tonnage. Please visit AIDA-America's booth and speak with one of our knowledgeable associates regarding how AIDA DSF Series Servo Presses can greatly improve the productivity of your stamping operations. Invitation for Press Conference During EuroBlech 2012 Show in Hanover AIDA – Metalforming for the Future: Technology, Trends and Facts We would like to invite you to our press conference during the EUROBLECH 2012 SHOW in Hanover. EINLADUNG ZUR PRESSEKONFERENZ ANLäSSLICH DER EUROBLECH 2012 IN HANNOVER AIDA – Umformtechnik für die Zukunft: Technologie, Trends und Fakten Wir laden Sie herzlich zur Pressekonferenz anlässlich der EUROBLECH 2012 in Hannover ein. Sprecher werden Herr KIMIKAZU AIDA (CEO AIDA ENGINEERING) und Herr KLAUS ROTHENHAGEN (VP SALES AIDA EUROPE) sein. Bitte melden Sie sich mit per Email unter krothenhagen@aida-europe.com an. Wir freuen uns, sie auf unserer Pressekonferenz begrüßen zu dürfen. Watch a Servo Press Run in Pendulum Mode, to Boost SPM by 30 Percent Batesville Tool & Die recently invested in a new AIDA 800-ton two-point servo-drive press and a new addition to its 255,000-sq.-ft. plant. Metalforming Magazine recently visited BTD to report on its new servo-drive press, and will feature the story in the September issue. In the meantime, they've posted a 2-min, video to the Multimedia Center of metalformingmagazine.com, showing the servo press deep-drawing 0.085-in. cold-rolled steel. With the press operating in pendulum mode, productivity rises by 30 percent compared to running the job on a standard mechanical press. AIDA-America Hosts Servo Press Symposium / Open House Dayton, Ohio, 6/25/2012 - On June 13th and 14th AIDA-America hosted its latest Servo Press Symposium and Open House. Nearly 120 attendees, representing close to 60 companies, were on hand to take part in technical seminars as well as have a first-hand experience with multiple demonstrations of AIDA Direct Drive Servo Formers(DSF Series). Visitors to AIDA-America's facility viewed presentations of HSLA blanking, part, production and process improvements and a sampling of AIDA's Servo Press range - a 110 ton, two-point straightside DSF-N2-1100, a 200 ton, single-point gap frame DSF-C1-2000 and a 630 ton, straightside DSF-M2-6300 (MCX Series) were all operational on the shop floor. With the elevated interest and excellent attendance to the event, it is quite evident that Servo Press Technology is an important topic for many throughout the metal stamping and metalforming industries. AIDA continues to support the need for this technology in these industries by offering its DSF Series Servo Presses in capacities of 80 - 3,500 tons. AIDA-America Expands Distribution Network for Michigan, AIDA Group opens New Offices in Russia & Morocco [Read More] AIDA-America has further strengthened its North American sales network by adding Midwest Press and Automation as the exclusive distributor for Michigan. The AIDA Group has recently opened new offices in Morocco and Russia, enabling quick and local support to customers in these regions. AIDA is committed to being readily accessible to customers via our extensive distributor and direct sales network, as well as, service and support locations throughout the world. AIDA-Europe Delivers the World's Largest Servo Transfer Press to a North American Customer [Read More] Calolziocorte, Italy 10/25/11 - AIDA-Europe, world leader in Servo Press technology for metal forming equipment, having delivered over 1000 pieces of equipment, in August supplied the world's largest Servo Transfer Press to a North American customer. Klaus Rothenhagen, Vice President of AIDA-Europe, said that this system, which consists of a de-stacker and Servo Transfer Press, is currently unique in the world of forming technology. AIDA Introduces New MCX Series Straightside Presses [Read More] Dayton, OH 8/15/2011 - The AIDA Global Group introduces its new line of straightside stamping presses, the MCX Series. The MCX, modular configuration series presses, offer stampers a wide array of press configurations and specifications. Options include: single or double gear, 1/4 or 1/2 inch rating points, five drive options, including mechanical or servo, a wide variety of stroke lengths and die height choices, and capacities ranging from 315 tons through 1250 tons. Visit www.aida-global.com/mcx to learn more about the MCX series of straightside presses and how they can help maximize your pressroom's flexibility, versatility, production, and profit. AIDA to Exhibit Multiple Servo Presses at Fabtech 2011 Dayton, OH, 8/15/2011 - AIDA-America Corp., Dayton, OH, Booth 3125, South Building, will be exhibiting and demonstrating two servo presses from its extensive range of metalforming solutions. The first press on display will be a NS2-1600(D), 160 ton capacity, straightside servo press. This press will be part of a completely functional line, stamping parts and presented at the show in cooperation with Formtek/CWP, Dayton Progress, AG Tool &Die, and Anchor Danly. The press is provided courtesy of Royal Die & Stamping. The second press in AIDA's booth will be a NC1-1100(D), 110 ton, gap frame servo press, demonstrating the servo presses' unique ability to reduce reverse tonnage and its ease of operation. Both AIDA servo presses will show how AIDA brings maximum flexibility to your pressroom through an infinite number of freely programmable, application optimized, speed, velocity and dwell profiles. Maximized flexibility means maximized productionand maximized profit for your stamping operation. Donation to Support Victims and Areas Affected by the Earthquake in JapanSagamihara, Japan, 3/18/2011 - The AIDA Group would like to express its deepest condolences for all those who lost their lives as a result of the earthquake which occurred on March 11, 2011 in the Pacific Ocean offshore the Tohoku district of Japan. We would also like to express our sincerest sympathies to the many people who have been affected by this natural disaster. We decided to immediately donate 10 million yen via the Japanese Red Cross Society to assist those who have been affected by this disaster and to aid in the recovery efforts in the affected areas. We sincerely hope to see a swift recovery in the affected areas and the AIDA Group will continue to do what it can to assist in these recovery efforts. High-Strength Steel Forming for Producing Lighter Automobiles [Read More] Sagamihara, Japan, 10/19/2010 - The forming system we are announcing here uses a newly-developed dedicated high-strength steel forming press at the first forming stage where the shape of the 100 kg high-strength steel is set, thereby achieving powerful and accurate forming that was impossible using conventional methods. The second and subsequent stages utilize AIDA's unique high-speed transfer technology to effectively leverage the existing equipment to enable efficient production. This new system is leading the way to a new chapter in high-strength steel metalforming history. AIDA-America to Exhibit at Fabtech 2010 Dayton, Ohio, 8/26/2010 - AIDA-America Corp., Dayton, OH will show you how to "Program Your Profit", using AIDA's ServoPro technology. 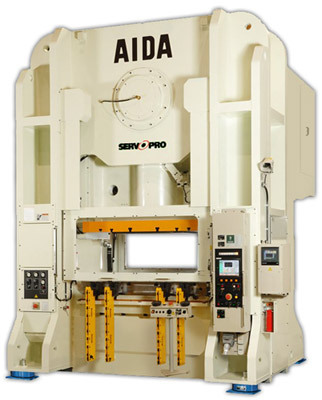 Servo driven stamping presses are available from AIDA in capacities ranging from 80 to 3000 tons, and in a wide variety of model types. The in-booth demonstration at this year's Fabtech Exhibition in Atlanta Georgia, of AIDA's NC1-1500(D), 150 ton gap frame servo press, will display completely programmable stroke, speed, and motion profiles possible with ServoPro. Visit AIDA at booth 1505 and learn how optimized production equals optimized profits with AIDA ServoPro. AIDA-America Expands Distribution Network for Tennessee Dayton, Ohio, 5/13/2010 - AIDA-America has further strengthened its North American sales network by adding Productive Stamping Solutions Inc. as the exclusive distributor for Tennessee. AIDA is committed to being readily accessible to customers via our extensive distributor and direct sales network, as well as, service and support locations throughout the world. AIDA-America Expands Distribution Network for Canada Dayton, Ohio, 4/14/2010 - AIDA-America has further strengthened its North American sales network by adding SP Consulting as the exclusive distributor for Ontario and Quebec, Canada. AIDA is committed to being readily accessible to customers via our extensive distributor and direct sales network, as well as, service and support locations throughout the world. AIDA Produces "World's Fastest Servo Press Line" [Read More] Sagamihara, Japan, 12/14/2009 - This is to announce that AIDA's large servo press line that was jointly developed with Honda Engineering Co., Ltd. and Honda Motor Co., Ltd. was the recipient of the Materials Process Technology (Sokeizai) Center's 25th Annual President's Industry Technology Award for 2009. AIDA-America Expands Distributor Network Dayton, Ohio, 12/21/2009 - AIDA-America has added PTW Sales, LLC as its exclusive distributor for Ohio, AMP Machinery Systems Inc for Northern Illinois, and M-Tech for Alabama and Mississippi. These additions further strengthen AIDA's North American sales network. AIDA's commitment to being readily accessible to customers is evident in its extensive distributor and direct sales network, as well as, service and support locations throughout the world. AIDA Launches New ULX-D Precision Servo Press [Read More] Dayton, Ohio, 11/3/2009 - AIDA is proud to announce the launch of a new servo press version of its ULX series precision metalforming press, the ULX-D. The ULX-D precision servo press series is a completely new and innovative metal stamping press that combines the award winning features of the ULX Series (2004 "Ten Greatest Innovations Prize" - Daily Industrial Press), with the highly celebrated AIDA ServoPro system (2002 "10 Greatest Innovations Prize", 2004 "Japan Brand Prize", 2009 "10 Greatest Innovations Prize" - Daily Industrial Press). AIDA ServoPro, with its unique high-torque/low RPM servo motor design, offers completely programmable stroke and velocity profiles and a direct drive system. Metalforming Solutions Industry Resources and Technical Information AIDA presses and transfer systems employ technologically advanced metalforming solutions, such as DSF Servo Press Technology, Hydraulic Overload Protection and Wide Connections Spacing, resulting in superior performance and the right stamping press technology for our customers. AIDA also offers a wide variety of metalforming resources, available to our website users, to help improve productivity, through examples of solutions used in a metal stamping production environment.